What makes the violins of Antonio Stradivari stand out in quality beyond those of any maker since? What is his secret? Perhaps there is none, and this idea that no maker can equal or surpass the Cremonese master is nonsense, hype, a myth. Perhaps Stradivari was simply a master craftsman who produced violins at the level of any master craftsman of any century. Could the average person, or indeed even professional musicians, tell the difference between an excellent early 18th century violin and a violin made by a contemporary master? I doubt it. But even if we discount Stradivari’s mystique, it is still interesting to speculate as to his method, and googling on the topic will lead one to many interesting articles and forums where makers and interested amateurs alike debate. One area which gets a lot of attention is that of the ground Stradivari used. The ground is the first substance applied to the bare wood in the process of finishing. It is followed by the varnish. Barlow suggested tentatively, on the basis of a single EDX run, that Stradivari’s filler could have been a kind of volcanic ash. Although the presence of some ash cannot be ruled out, the transparency of the finish rather suggests that finely crushed mineral crystals, like quartz, calcite, feldspar and gypsum, were the main components of the filler powder in most instruments. There have been other scientific examinations of the ground as well, identifying elements which would make volcanic ash seem reasonable, were it not for the issue of transparency. It did not appear as though Stradivari was giving his instruments an initial coating of mud. But let us not forget that volcanoes don’t only spew forth ash, they also may belch out molten silicon dioxide containing other elements as well, such as potassium, iron, and sodium. This then cools into volcanic glass, or obsidian. A chunk of obsidian appears dark or even black, but a thin slice is transparent. I ventured to experiment with obsidian ground. In fact, I thought, why not go all the way and varnish a complete violin? Because that would be stupid, I told myself. I don’t know anything about varnishing violins. 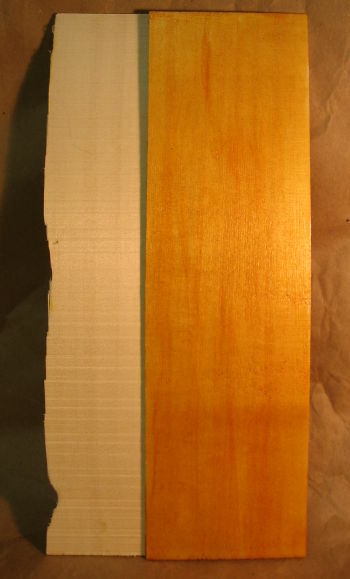 So I ordered some scraps of spruce from tonewood dealer Simeon Chambers to do my experimenting on. And I set to work powdering obsidian. A big question remained, though, before undertaking the experiment. What medium carried the obsidian? I have no idea. I do know that, in olden times, violin makers used something called vernice bianca as a ground applied to the wood prior to varnishing, so I decided to use that as the medium for the obsidian powder. Note: The following is taken directly from American Lutherie #10 in 1987 in an interview with Jack Batts. It is also in The Big Red Book Vol. 1 from Guild of American Luthiers. albumen from one egg white. May 31st, first day, first attempt. I modified the recipe somewhat. Instead of honey and rock candy I would use a teaspoon of granulated maple sugar. And I would add two teaspoons of powdered obsidian, as well as a tablespoon of kamala, a yellow dye. First problem was how to measure the gum arabic. I ordered this from Luscombe Violins, along with the kamala, some sandalwood, and catechu. It came in a hundred gram bag. I don’t have scales. I suppose I could have estimated a quarter bag (25g), but in the interests of precision, I measured it out. It was eight tablespoons. So I would need two. I put the teaspoon of maple sugar into the hot water before adding the gum arabic, but I don’t think that made any difference. I put the gum arabic in a little at a time. It didn’t mix easily at first, forming sort of rubbery clumps. It got easier as the liquid became more of a gum arabic solution. Then I added the tablespoon of kamala. It didn’t mix at first, but eventually appeared to. I tried filtering this through four layers of cheese cloth, but . . . well, in my defense, I’ve never filtered anything through cheese cloth. Nothing appeared to be happening, so I gather up the top edges and tried to sort of squeeze it. Unfiltered vernice bianca squirted up out of the cheese cloth and spilled in with the filtered, so that operation would have to be tried again. Did it twice more with double layers, and once for good luck with a triple layer. 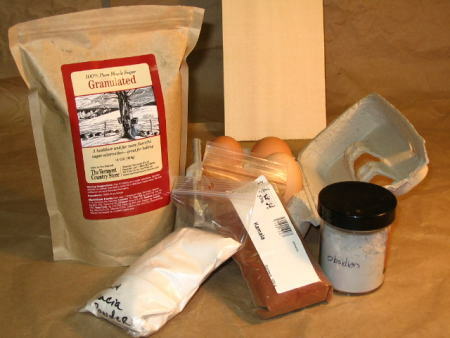 I next added two teaspoons of powdered obsidian and stirred it in. I suspected this would want to settle out, and sure enough that would be the case, requiring regular mixing to keep it suspended. I used a very fine scientific sieve, but perhaps I could use one finer still. Earlier I had whipped up some egg white. Having sat for awhile, the albumin had settled out just as the instructions said. Added that. 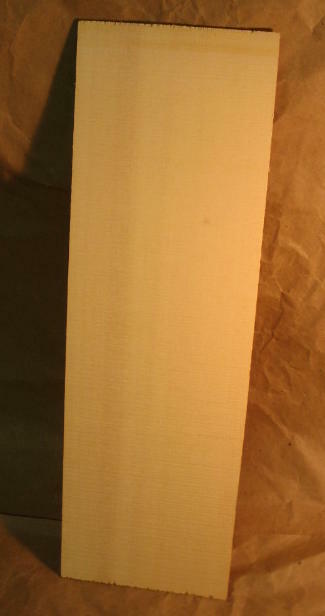 Here is an image of the board prior to application of the vernice bianca. I applied the vernice bianca with fingers and thumbs, pressing it into the wood (from a comment on the maestronet forum: “Oh yes, epithelia/skin flakes are also found in Strad’s ground indicating it was applied using the bare hand rather than a brush”). Unfortunately, particulate kamala started to emerge as I rubbed it in. It hadn’t really dissolved in any meaningful way, it was just pretending. I had experimented earlier with mixing kamala and linseed oil, or attempting to, since it didn’t really mix. 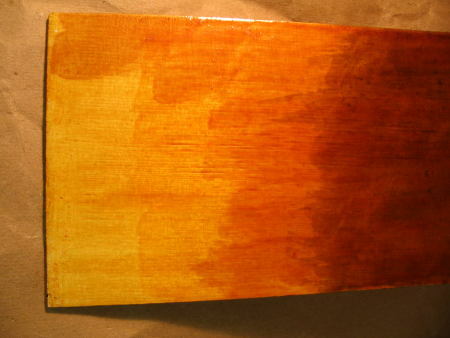 Pushing it around on paper did result in a yellow stain, and likewise, while particulate was coming out, the board was also turning yellow. The pot contains my home made vernice. Where the stain is browny is where there are particles still of kamala. For the most part they come out and can be scraped off, but the whole thing is messy and pretty much impossible to get an even finish. I boiled up a tablespoon full of kamala in a little more than 100 ml of water, then put it through a coffee filter. Result? Dark yellow water. Just for safety’s sake I put it through a coffee filter again. Very little difference. After a couple of hours in the fridge, a very small amount of sediment had gathered. I will try again another day using the yellow kamala water. Another day, another piece of spruce. Today I made the vernice bianca as before, but this time using the kamala water, and adding the sugar after the accacia (or gum arabic, same thing). I also got another sieve for the powdered obsidian, now down to a particle size of no greater than 63 micrometers (that’s 0.063 mm). It still settles and the obsidian enriched vernice bianca requires perpetual stirring up. The kamala water can be regarded as a success if the primary objective was an even coating. One could wish, however, that the yellow was more intense. 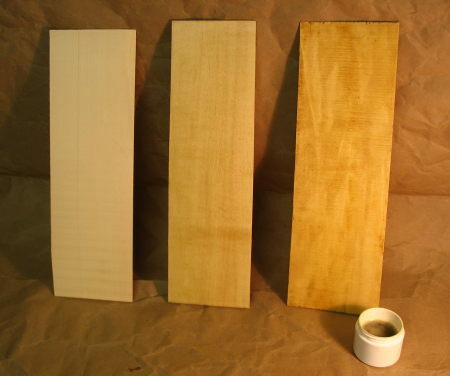 Here is an image of 3 spruce boards. The one on the left is untreated, the one on the right is the first attempt, and the one in the middle is this most recent attempt. In both attempts it may be noted that the obsidian is invisible. It’s there, certainly, but you wouldn’t know it. I think I’ll add another two teaspoons of obsidian to my vernice bianca and see if that makes a difference. Here’s a picture of the powdered obsidian. 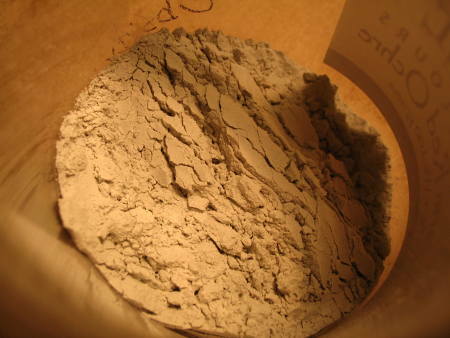 It looks just like a grey powder. It’s “true” colour is only betrayed when added to the vernice bianca. The more obsidian powder, the more the colour moves from yellow towards green. 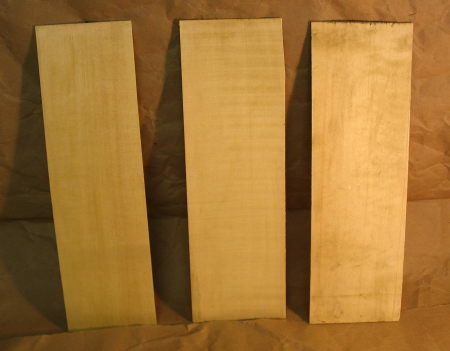 And here are three boards treated with vernice bianca with different amounts of obsidian powder. The first is from our 2nd trial, with a vernice bianca that has two teaspoons of powered obsidian added to the recipe. The middle one has four. The final one is an attempt with six. It looks like four is about optimum. By the time we get to six, we run into the same problem I had with the kamala, namely it came out of solution as I rubbed, a kind of grey mud, and that made it difficult to get an even finish. For the purposes of our original objective of experimenting with the ground, we are done. The clarity of the obsidian, if not over-saturated, allows for volcanic minerals to be present in the ground without causing the surface to be muddy. However, in the interest of thoroughness, we will now add a varnish. We’re going to do the simplest possible coloured spirit varnish, just Canada balsam and isopropyl alcohol with a bit of kamala in an attempt to get it to be more yellow. We’re deviating from the Cremonese pattern here, since it’s highly unlikely they used Canada balsam, and probably used oil varnishes rather than spirit. But in the interests of simplicity and patriotism (nothing can ever be too Canadian), this is the approach I’ll take. I mixed five ml of Canada balsam with 10 ml of isopropyl alcohol, then added a teaspoonful of kamala. That’s probably too much, it didn’t all mix in. Tested on some white paper and got a very promising shade of yellow, though with the particulate, of course. Forced it through a coffee filter. I think it was a little too thick to go on its own. Perhaps I should try three parts alcohol to one Canada balsam. Pressing 15 ml of liquid through a coffee filter is a bit of a sticky mess, but it’s doable. A larger amount would be awkward. Here is a picture of the result, next to a piece of unfinished spruce. Beautiful. Clearly it’s an incredible waste of time trying to colour the vernice bianca, when right off the bat, with a single coat, one can get such a nice yellow in the varnish. Next coat red. Mixed five ml Canada Balsam, with 15 ml isopropyl alcohol, plus a teaspoonful of powdered sandalwood. 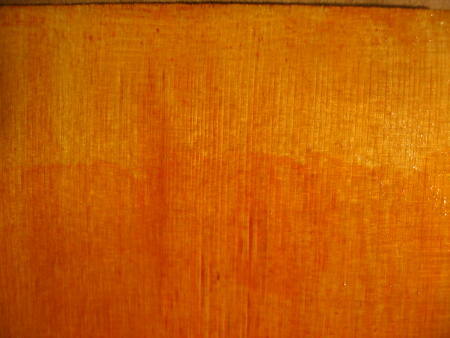 The thinner mixture did indeed strain more easily, but the resulting wash was very thin and with minimal colour. There’s no picture because the difference is so subtle that I don’t think the camera would pick it up. I noticed, wiping the brush on paper, that while the liquid in the brush initially was a very washed out pink, after brushing it was a very washed out orange, suggesting it had gone through the clear layer to the yellow. Part of the purpose of the clear layer was to prevent just that. Mixed up another batch with 10 ml Canada Balsam, 15 ml isopropyl alcohol, and two teaspoons full of powdered sandalwood. I’ll leave this overnight and test before straining to get an impression of the intensity of the colour. If it’s still wimpy I’ll try cooking it a bit, though would rather not, as this mixture contains something of the design of napalm — sticky thing mixed with highly flammable thing. Clear coat. 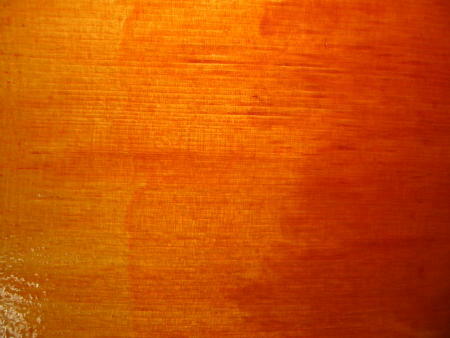 Sandalwood varnish is a bit darker, but not much. Tried cooking the sandalwood varnish a bit. Even over very low heat the alcohol boiled off fairly quickly. Added back five ml and tried to squeeze it through the coffee filter, but it was really too thick, just got a a couple of ml. Soaked the filter in another five ml, kind of like a tea bag, mushing it about a bit, and added that. The effect is subtle but sufficiently noticeable to warrant a picture. 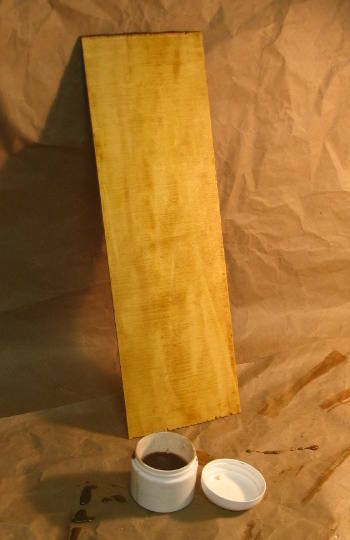 Perhaps three coats of this would make a significant difference, but I’m aiming for more of a brown anyway, so here we will leave off messing with sandalwood. Cooking doesn’t appear to make make much of a difference. I may try soaking some in alcohol for a couple of weeks and see if the extended soak makes a difference. Mixed together five ml Canada balsam, 10 ml isopropyl alcohol, and a teaspoon of catechu, hoping for a nice brown. Sadly, an initial test on paper was so washed out I’m not bothering today. I’ll let it soak overnight before straining and hopefully get at least a little browner. I’ve also put three teaspoons of sandalwood in a small container with 25 ml of isopropyl alcohol, as well as three teaspoons of catechu in another container with 25 ml of isopropyl alcohol. I’ll leave these set for a couple of weeks to see what happens. I recalled that Leif Luscombe had a recipe for varnish in which he’d used these ingredients, so went back to look at it. In the section on colour down at the bottom, he mentions that the container should be placed in warm water to bring out the dye. So we’ll do that today and tomorrow with the sandalwood and catechu I’ve got soaking, and see what happens. A bit of the sandalwood spilled out into the soak water, and looks like blood. Promising, but I’m going to put that aside for a future attempt. The catechu actually is brown. After straining, I have about 14 ml of brown alcohol, to which I add seven ml of Canada balsam. The effect is still not as strong as I’d like, but it registers well enough for a picture. I could get a deeper brown by giving it a few more coats I’m sure, but I would like to wrap this up before backofthebook.ca wraps up for the summer, so I added two pinches of very finely powdered shungite to the remaining brown varnish. Shungite is very, very black, and so fine there’s no need to filter;it’s like adding pure black. It’s a bit of a cheat, of course, since we’re coming close to crossing the line between a transparent varnish and a paint. So, after all that, how does it sound? Very nice. How can a board sound? Well, you hold it gently by one corner and tap on it with a small hammer. It does resonate with a pleasant tone with a nice sustain. Of course, it did pretty much the same thing before I put all this goop on it. Simeon Chambers sells nice tone wood, even his scrap pieces. That’s one of the several things for the next attempt; record before and after tap tones to see if there’s even a subtle difference. I think it has a better sustain from what I remember, but it would be nice to have an audio recording to refer to. Next time I will use two or three coats of powdered obsidian enriched vernice bianca, but without colour. The sandalwood layer will be stronger in colour, and rather than cheat with the shungite, I’ll see what sort of brown I can get with multiple layers. I’ll also add some spike oil to slow drying in the interests of getting more even layers, and will experiment with sanding between layers towards getting a smoother surface. Not ash, but glass. There you have the secret of Antonio Stradivari. I use clear gelatin as the ground coat for the violins I make.